The randomly selected winner of my birthday giveaway ($20 Amazon gift card and $20 donated to the Red Cross) is: Tina of Food for Tina. Congrats! My dear friend sent me these Dorie Greenspan cookies for my birthday!!! Most delicious gift ever! Dorie's store is open in New York...and it's my dream to visit. However, we now have delivery. I received a sleeve of Classic Jammers, World Peace Cookies and Sables. OMG...they are so delicious - I love them all. The Classic Jammers are my favs (but picking a favorite is like picking your favorite child). Order yours today! My friend Azusa has developed another recipe booklet! You can find simple, delicious recipes for clear mushroom soup, sesame dressing, oyako donburi, ramen cabbage salad and more. On Etsy for $15 plus shipping. I got this for my birthday! I love all things Moleskin and can't wait for the new year to start to use it! Each month is a different color and you can keep them all in this book for years to come. In all the police procedural movies and books I've read, it is important to hang onto your calendar to prove your alibi. Just saying. $40 retail. I live in earthquake land and we never know when the big one is going to hit. This is a little radio/flashlight/cell phone charger hand crank thingy that I keep by my bed and in the car. For about $40, I feel a little better having it at the ready. It may not be the most glamorous gift, but the recipient will love you when they need to charge that cell phone after an earthquake, storm or power outage. This is a fun book I got a couple years ago. Each page has one day (such as December 7th) with five sections. You fill out one section per year. Then, you can look back to what happened one, two, four years ago. You only have room for a couple sentences so you can basically tweet your day. :) I'm almost done with my second year, and it is enlightening to see what happened a year ago...sometimes it'll make you cringe at how fast a year goes by! $12 on Amazon. Finally, after all this holiday shopping and cheer, it's always nice to have someone else cook for you. 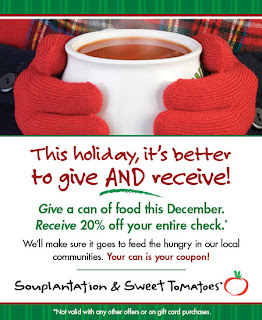 The folks at Souplantation told me about this special: bring in a canned food donation and get 20% off at Souplantation during December. 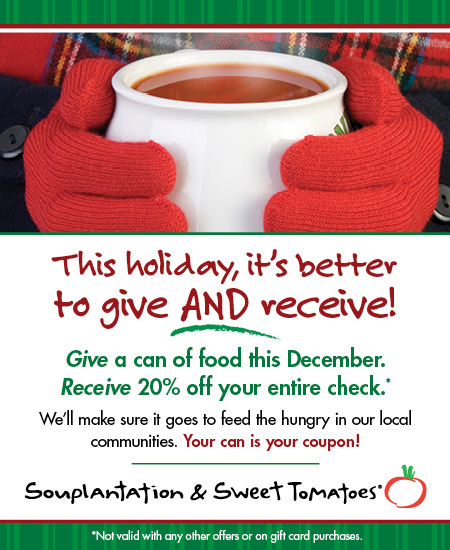 Your donated food will be given to local food banks! FCC Disclosure: I'm part of the Amazon affiliate program so I get a few cents if you click on my links and buy something on Amazon (don't worry, I never know who buys what so if you want to buy ten copies of 50 Shades of Grey, no biggie). i love that one line a day memory book. That is going on my wish list! Mary, thank you for letting your readers know about my little recipe booklet. The other gift ideas are great... I have my eye on that 5-year memory book as well! I love the memory book, just added it to my amazon list!